Whenever there are big price drops on Apple devices from retailers, it's usually an indication that something new from Apple is on the near horizon. Will the iPad get a refresh soon? Bingo! Finally the fifth-generation iPad, called iPad Air, arrived yesterday. Again, its splendid 9.7-inch Retina display with a resolution of 2048x1536 and 264 ppi lets iPad Air easily fend off other similar tablets and makes it the first choice to enjoy videos and movies. As a YouTube aficionado, you surely cannot wait experiencing the great visual feast with the fifth generation of Apple iPad. However, watching YouTube video on the new iPad Air is not as convenient as it used to be since Apple's feud with Google leads to YouTube's removal from iOS devices. Worth still, even though you've installed a YouTube app in your new iPad Air, the bother of slow network connection and buffering is still a headache when you watch online YouTube video on the iPad Air. Actually, to download YouTube video on iPad Air can be a solid choice for later enjoyment leisurely. You may question YouTube videos, usually saved in FLV format, cannot be viewed on the new iPad Air as this iOS gadget only recognizes MP4 video instead of FLV file. Then how to play downloaded YouTube videos on iPad Air? Well, never mind. 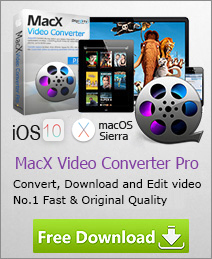 This guide will show you how to download and convert videos from YouTube and play them iPad with MacX Video Converter Pro, which entitles you to download videos from YouTube, Facebook, Dailymotion, Vimeo, Metacafe, etc. (300+ video audio sites supported) and convert Youtube 4K UHD video to iPad Pro acceptable video formats like MP4, MOV for playback easily. Feel free to download/process movies, videos, TV shows, music etc from YouTube to iPad Air/Air 2/mini 4/iPad Pro in 4K HD 1080P/720P all types with fast speed and no quality loss! This YouTube to iPad Air converter is versed in downloading YouTube videos on Mac and Windows, as well as other 300+ online sites videos, and converting among a diverse array of HD and SD videos, ranging from MOD, AVCHD, M2TS, MKV to MP4, MOV, FLV, AVI, etc at blazingly fast speed. With the iPad Air video converter for Mac in hand, you can download and watch HD movies videos on iPads (iPad Air 2/mini 4/3/iPad Pro), Samsung Galaxy Note 8/S9, etc anywhere anytime. In case you want to play YouTube FLV on iPad Air, download and run YouTube to iPad Air converting software on Mac (Mojave) or PC (Windows 10). Then you just need to click YouTube button to add the YouTube video URL. If you already opened a YouTube URL before you run the program, it will automatically paste it for you. Now it is time to encode the YouTube video to a format compatible with your iPad Air like MP4. Actually, MacX Video Converter Pro also enables you to convert YouTube video to iPad Air straightly by selecting "To iPad" as the output format. Then you can adjust the video resolution, frame rate, video quality, etc of your choice to get the best video quality as you want. After finishing the above steps, you can start transcoding sYouTube to Apple iPad Air/Pro/mini 4 easily on your Mac computer. This video converter for iPad Air sets the standard for easy video conversion. Just four clicks, you can enjoy YouTube videos on iPad Air on the go. It’s worth mentioning this tutorial is available for Mac users. For those who are applying PC computer, just head over to its windows version to get YouTube video downloaded on iPad Air. This tutorial shares a wonderful YouTube to iPad converter for Mac to download and convert YouTube videos to iPad friendly format on Mac computer easily. With this software, you can enjoy YouTube videos on your fashionable iPad Air, iPad Mini, iPhone 5, iPod Touch, etc anytime anywhere. This article is a guide to know how to convert YouTube FLV to iPad with a professional FLV to iPad Converter, which with you can play YouTube FLV video on iPad Air, iPad Mini, etc and also convert AVI, MKV, M2TS, AVCHD, H.264, MPEG-2 HD, WMV, FLV, MP4 etc to iPad supported formats on Mac computer.